The overall goal of our research is to understand, control and utilize molecular recognition and self-assembly processes to create functional and complex nanostructures via the strategic application of dynamic covalent and non-covalent bonds. The main expertise and skills of the group is preparative chemistry and organic synthesis, which we apply in to supramolecular chemistry, dynamic combinatorial chemistry and the development of new dynamic/adaptive materials. Research in the Stefankiewicz laboratory is divided into the four main areas listed below. DCC deals with chemical systems under rapidly attained thermodynamic equilibrium and was developed independently in the early 90’s by the research groups of Professor Jeremy Sanders and Professor Jean-Marie Lehn. Combinatorial chemistry under thermodynamic control leads to the generation of so called Dynamic Combinatorial Libraries (DCLs) of interconverting species whose composition is adaptable and can be systematically altered by the application of environmental stimuli or chemical “templates”. In DCC reversible covalent bonds and non-covalent interactions are employed, which under appropriate conditions are capable of breakage and reformation. In our laboratory we are using mainly dynamic disulfide, hydrazone, imine and boronic ester linkages for the creation of adaptable materials and functional nanostructures of interesting strucutral and topological properties. We are mainly focused on the generation of dynamic macrocyclic, linear and cage-like receptors using combinatorial approach and investigation of their physicochemical and complexation properties. The controlled generation of specific metallosupramolecular architectures rests on the design of ligands incorporating suitable binding subunits and the implementation of metal ions presenting coordination features required for the correct reading of the structural information of the ligand. In our laboratory we are developing 2D and 3D metallosupramolecular architectures using imine, hydrazone and acyl hydrazone based ligands together with d- and f-block metal ions . Our main target is to obtain functional multimetallic architectures which could be potentially used in the field of nanotechnology as molecular information storage devices, sensors, and electronic switches. Discrete three-dimensional compounds with defined pores are particularly attractive as they present the ability to accommodate various guest molecules and induce them to exhibit new properties. Owing to their complex but highly elegant structures supramolecular nanocapsules have captivated the attention of many investigators as molecular flasks for confined chemical reactions and their uses in the stabilisation of reactive molecules, chiral separations and catalysis. In our laboratory we are developing the chemistry of entirely new class of spherical nanoarchitectures build from amino acid functionalized molecular components. We are exploring and expanding the scope of structures that can be prepared whilst conducting fundamental investigations into their physicochemical properties. 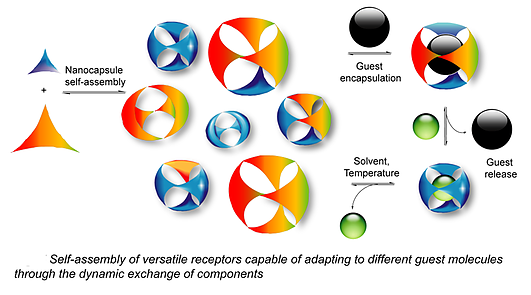 The adaptive and dynamic character of the investigated nanostructures may find use in the creation of guest-specific receptors/sensors and versatile catalysts. 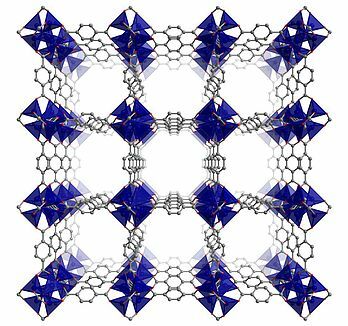 Metal-organic frameworks are a class of coordination polymer that have received significant recent attention as they display zeolite-like properties such as regularity, porosity, robustness and high surface-areas that can lead to potential applications in catalysis, gas separation and storage. These crystalline solids are composed of organic ligands that bridge metal centres to form uniform 3D extended network structures with pore dimensions typically in the range of 3-20 Å. MOFs display fascinating physicochemical properties such as interpenetration, thermal expansion, spin-crossover and flexibility, which can be trigged by the presence or absence of guest molecules, making them potential targets for nano-technological and industrial applications. MOFs are usually prepared under solvo- or hydrothermal conditions in solvent such as N,N-dimethylformamide, which slowly decompose upon heating and generate bases capable of deprotonating organic linker molecules. 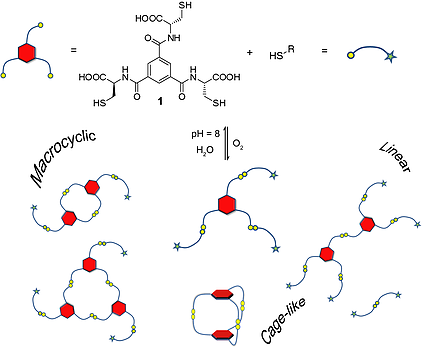 The latter react with metal salts and produce 3D meta-organic networks. In our laboratory we are employing supramolecular chemistry in the creation of new type of porous materials with predictable properties such as selective guest binding. Our approach is to first prepare and characterize metallosupramolecular architecture and latter convert it into the framework materials using reversible linkages. © 2018 Stefankiewicz Research Group, All rights reserved. Powered by Wordpress on modified Twenty Eleven theme.